LGIM employ 1165 people in the UK. These statistics show that in April 2017 LGIM were broadly in line or just in front of the industry average. 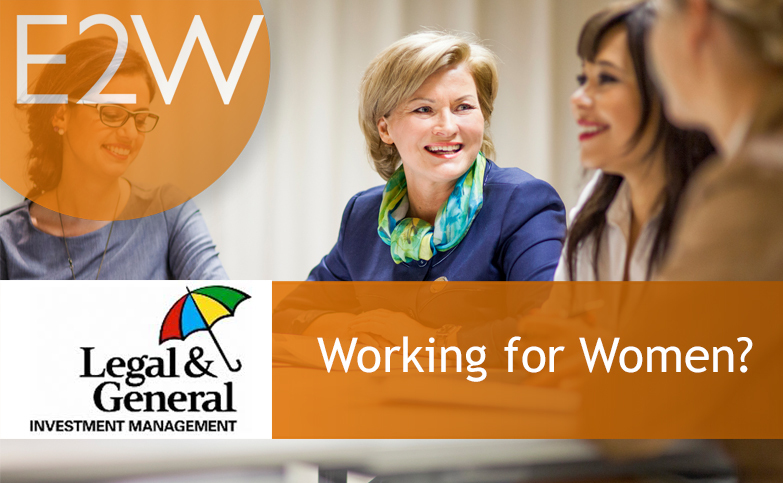 To meet their Charter commitments and move towards their 50/50 by 2020 aspiration Legal & General has set a target to increase the representation of women in middle to senior management roles from the current level of 35% to 40% by the end of 2017. The 30% Club - in 2010, a cross-business initiative aimed at achieving better gender balanced boards through voluntary, business-led change. The Diversity Project, co-founded by Helena Morrissey, was set up to accelerate progress towards an inclusive culture within the investment and savings industry. “We strive to make diversity and inclusion part of our everyday conversations and actions. It shapes our approach to our clients, employees and other stakeholders, as well as our position in the financial services industry and wider society." E2W Comment – It is clear to us that the LGIM leadership team are truly committed to diversity and have developed strategies, supported initiatives and lead by example. The indications that we receive from our members & the people we work with at LGIM are that the board have not only set the agenda, they have empowered, targeted and rewarded all staff to take responsibility for implementing change. The internal recruitment team are targeted and measured on meeting diversity targets for all new hires. They have a range of KPI’s in place to monitor and measure success including the gender make up of applicants to the relative success of each applicant in all stages of the process. LGIM are rethinking their interview experiences for female candidates by introducing, for example, diverse interview panels and interview training. They are also implementing specific initiatives to try to move the needle in areas where there is a shortage of diverse talent i.e. technology. As part of the rethink of recruitment practices, LGIM have started to work with E2W which provides LGIM with qualified female candidates for open roles across a range of specialities. The E2W Survey on Recruitment Practices from 2017 highlighted some of the poor experiences that female candidates have suffered when applying and interviewing for roles. This can deter women from pursuing and even accepting roles, so it is critical that recruitment practices are reviewed and changed where necessary. "We aim to have balanced shortlists and use diverse interview panels, to ensure a fair and inclusive interview process." "We expect our recruitment partners to engage and support our inclusivity plans and have recently selected new partners who have demonstrated their ability to source diverse talent." "Training is in place for interviewers, to focus on delivering fair and balanced outcomes for candidates." An institution’s talent pipeline needs encouragement from graduate right up to senior level positions; it refers to newcomers as well as existing potential. Are there strategies in place to ensure that women succeed such as mentoring and sponsorship? "We have mentoring programmes for senior women and our pipeline talent, including participating in the 30% Club’s cross-company mid-career mentoring scheme." "We are committed to having a gender balance when recruiting early career talent." "We analyse the proportion of men and women at different stages of the career journey and in different parts of the business and work to improve the balance at all levels through identifying key talent." Commitment and culture are closely linked – both come from the top down and it’s critical that the message is consistent and seen to be executed by senior leaders.
" Wherever possible, we are creating an agile work environment. We provide the technology, support and training to enable people to adopt more flexible and empowering working practices." "We have a programme of workshops available to our businesses to support working parents and carers. We also offer new parent coaching."